CRG’s Head Officials Heading to 2014 WFTDA Playoffs! 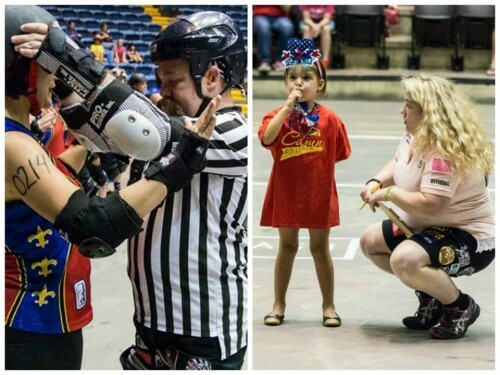 Congratulations to CRG’s Head NSO OrgAnnica and Head Referee Short Fuse, who will be taking their officiating skills to the national level once again for the 2014 WFTDA Division 1 and 2 Playoffs! OrgAnnica was named to the NSO teams for the D2 playoff site in Kitchener-Waterloo, Ontario, Canada, as well as an NSO for each of the D1 Playoff sites (Sacramento, Calif.; Evansville, Ind. ; Salt Lake City, Utah; and Charleston, WV)! Short Fuse will also be at each of the four D1 Playoff sites. He was named to the referee crews for Sacramento and Salt Lake City, and an NSO for Evansville and Charleston!